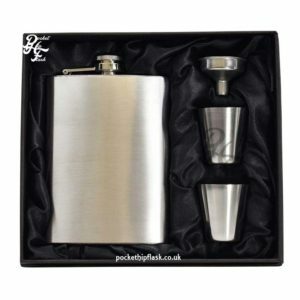 Flask Company we realise that people love to give hip flasks as gifts so we have put together a fine selection of hip flask gift sets that really will make that perfect gift. 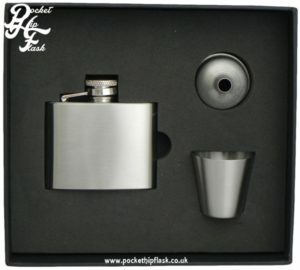 As well as people loving to give hip flasks as gifts, we know that they also love to receive them too! 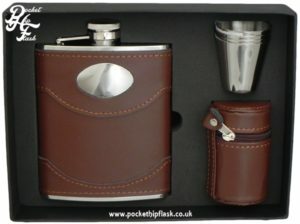 Our collection of gift set hip flasks will be sure to make anybody receiving these lovely items one very happy person. 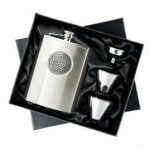 What Gift Sets Do We Offer? 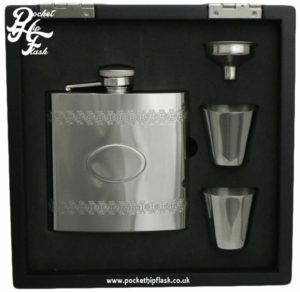 We have a lovely collection of hip flask gift sets for you. 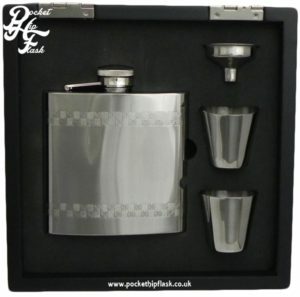 Some are presented in card boxes and some are presented in lovely wooden boxes. 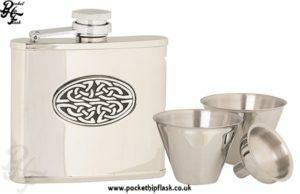 These sets come with both funnel and cup. 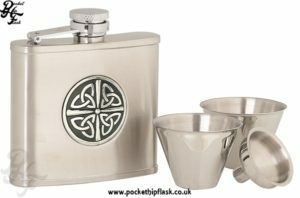 Some sets even have 2 cups so that you can share. 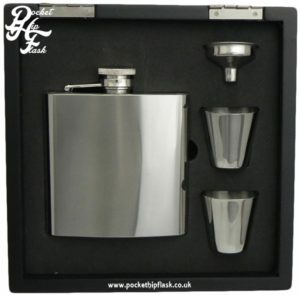 We sell leather, leatherette and engrave-able stainless steel hip flask gift sets. 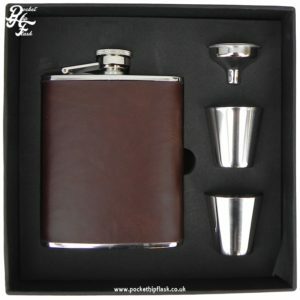 These sets are made and put into out wooden hip flask gift sets boxes. 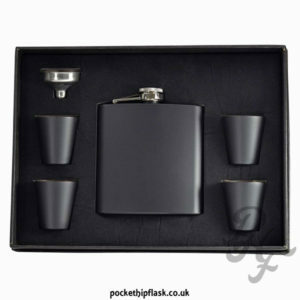 These wooden boxes are strong and made to a very good quality. 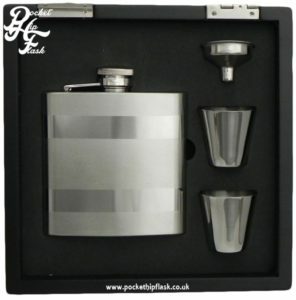 These wooden hip flasks sets really help to bring the hip flasks to life. 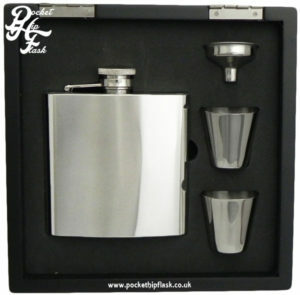 The cardboard boxed hip flask gift sets that we offer are produced as great affordable gift ideas. 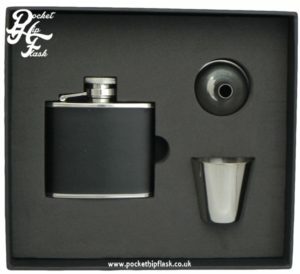 They are well made and contain everything a person needs to use their new hip flask gift. 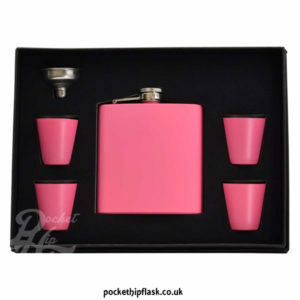 We offer several different varieties of sets including pink leatherette, black leather, plain stainless steel as well as one cup and two cup sets. 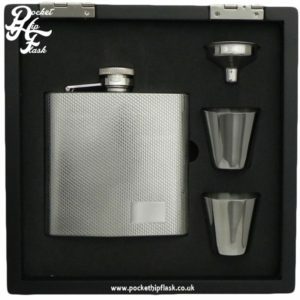 We are sure that whatever hip flask gift set you are looking for we will have something that will make someone very happy. 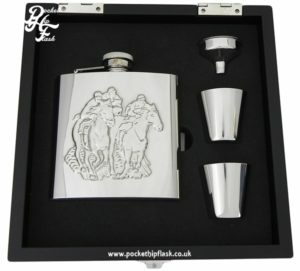 Personalise one of these hip flasks with one of our stand out engraving fonts. 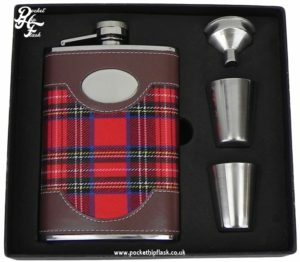 Pop on a personal message to show someone that you were thinking of them and make that gift extra special.